Education course providers and offerings will vary between states, so check with your local course provider or state boating agency to find out what courses are accepted in your area. 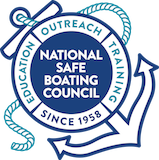 Many states require completion of a course verified by NASBLA as meeting the national boating education standard for powerboat rental or operation. To ensure a course qualifies, look for the ‘NASBLA-Approved’ logo. Forty-nine (49) states and U.S. territories require proof of completion of a boating education course for operators of some powered vessels.